For Donations To Central Coast Herding Dog Rescue, Thank You! Central Coast Herding Dog Rescue (CCHDRescue) is dedicated to helping find homes for Border Collies, Australian Shepherds, Australian Cattle Dogs/Queensland Heelers and other herding breeds and mixes. This site lists dogs in shelters as well as dogs in homes and foster care, and is intended to help adopters seeking good dogs, and dogs seeking loving homes. Our geographical area covers Ventura, Santa Barbara, and San Luis Obispo Counties. If you have a dog that you would like to list on this site, please email info@cchdrescue.org. We will need at least one good photo as well as a detailed description of the dog and contact information for you. NOTE: We will not list a dog that is not spayed or neutered; it is irresponsible to place an intact dog, where it may be used for breeding and create more unwanted pets. DISCLAIMER: Central Coast Herding Dog Rescue disclaims any responsibility for claims made about dogs listed on this site. We may not have met or evaluated a dog that is listed; we are simply posting information about available dogs in the central California coastal region, along with links to rescue groups elsewhere. Screening of dogs and owners is the responsibility of the parties listing dogs or responding to listings about dogs on this site. "Like" CCHD Rescue on Facebook and see the most current pictures of adoptable dogs, updates about CCHD alumni in their forever homes, and keep up to date on adoption events and fundraisers. When you see dogs like this in shelters, you just have to wonder how people can be so stupid. . . . This stunningly gorgeous boy, originally named Kyd, came in as a stray to the Lompoc shelter. When no one came to claim him, he went into foster care for CCHD Rescue, and was placed in just a few days, with an owner smart enough to recognize his beauty of brain and heart as well as body. As Bodhi, he is a loving companion, helpful classroom assistant, and high drive walking companion. Bodhi had to teach his new mom how to own a Border Collie (she'd been used to Labs, so much mellower and less in need of mental stimulation! ), but she got the hang of it and now they are a perfect team. Thanks, Jennifer, for letting this boy into your heart! 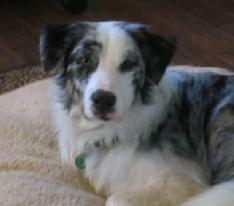 Teddy, now known as Ned, is a handsome, AKC-registered BC who grew up on a ranch but never showed any interest in sheep. He had a tendency to spin compulsively, which his owners didn't understand; they assumed he was brain damaged and were ready to put him down. A few months with CCHD Rescue did wonders: he still likes to spin, but a simple, "Ned, lie down" is enough, and he's at his happiest out in the field working sheep! He also gets to live with Remy (seen above, herding) and Night (the handsome black BC to the left) and Linus the Cat. Many thanks to Kay for giving him the best home one could ask for! Sometimes the sad stories do have happy endings. . . . Kippy was dumped at a vet clinic last fall, and kept there for two months while the staff tried to find him a home. He was very shy, and particularly afraid of men. They contacted CCHD Rescue and we put him in foster care, where he blossomed: it turned out he loved other dogs, was respectful of cats, would chase a ball for hours, and thought children were the best things in the universe. He quickly relaxed and showed himself to be a calm housedog, good trail companion, and obedient sweet boy overall. From there, he easily found a home with a loving family of four young girls, a wise older dog, a ranch cat, and an acre to chase a ball on. No dog is more deserving of such a great home! Bosco came from a home with more love than money -- his owners kept getting animals, even though they couldn't afford to feed them. By the time he came to the Lompoc shelter, he was 10-15 lbs under weight. But his gentle loving spirit was undimmed. They don't come much better than this lovely boy, who is now the center of an adoring household. The happily sleeping white and tan Cattle Dog mix is Mattie, saved from a high kill shelter in Kings County by CCHDRescue volunteer extraordinaire Wendy. In the photo, Mattie is sleeping next to CCHD Rescue's resident mascot, Henry, who has mentored many a rescue dog in the ways of being a good house dog. Not that Mattie needed much help -- she was a good girl from the start, obedient and sweet, and very conscientious in babysitting a litter of Pointer mix puppies living with us at the time. Mattie soon went to a loving home, and is now "Lola," the apple of her new family's eye! 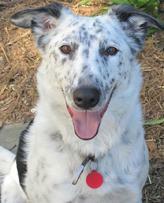 Millie is why we love cattle dogs -- full of fun and play, fearless, indefatigable. She came into the Goleta shelter dirty and bedraggled, and promptly picked up a bad cold. But she didn't let that, or a complicated spay, stop her; she spent two weeks in foster care with CCHD Rescue before going off to her dream home, where she lives with three other blue heelers, a couple of horses, and the best adopter in the world. Thanks, Diana, for making Millie's life so wonderful! 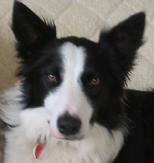 Penny is a classic case of why Border Collies are special and not for everyone. Ranch bred, she was bought as a pet and kept in a backyard, allowed to breed casually with the family's other BC, then given up when the owners had to move. She'd had no training or socialization, but showed extraordinary drive -- this is a dog that needs stock! It took a while, but Penny found a new home with someone interested in developing her potential, and now she gets to work sheep and cattle when she isn't chasing balls on the beach or sleeping blissfully on the couch! Poor Cliffy did not get a good start in life. He was bought as a young puppy to work cattle -- Cliffy was too young to work, his owner just left him tied to a tree in the yard. Fortunately, a family friend intervened and took him on, then found us at CCHD Rescue. Cliffy was such a sweet, gentle soul that it only took him a few days to land a fantastic home with Maggie and Gary and their older dog Ruby, all of whom love Cliffy, now Lefty, without reservation. A true happy ending!